The Indigo Hamlet is a member of the Serranidae family of Sea Bass or mini Grouper. 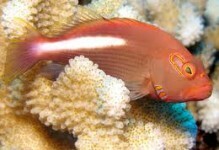 They are found living on coral reefs throughout the Caribbean, Gulf of Mexico, Bahamas and Florida Keys. Indigo Hamlets generally grow to about 5 or 6 inches in length, which makes them large enough to prey on small crabs, shrimp and fish. However, they will not generally bother fish larger than 2 inches in length and are considered only semi-aggressive towards their tank mates. Indigo Hamlets do well in the aquarium environment and can be housed in a variety of setups including both Coral Reef and FOWLR aquariums. Only the smallest tank mates (less than 2 inches in length) are at risk of being seen as prey. Well fed Hamlets should leave the majority of cleaning crew invertebrate species alone, but they may predate on some small shrimp and crab species. 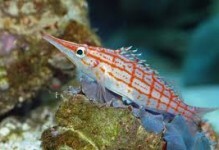 Hamlets are somewhat unique in that they possess both male and female reproductive organs. 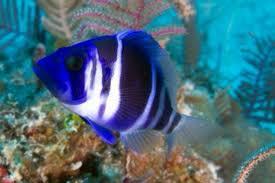 They are also known for breeding in larger aquarium systems and in commercial breeding facilities. 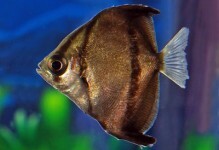 Overall their coloration, size, temperament and general availability make the Indigo Hamlet an excellent aquarium species. 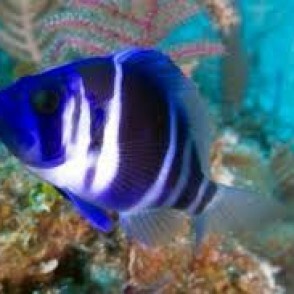 Indigo Hamlets do well in the home aquarium if provided some basic aquarium and water parameters. They should be housed in an aquarium that is close to 70 gallons or larger in order to provide them with enough swimming room and with enough water volume to accommodate the bio-load they produce. 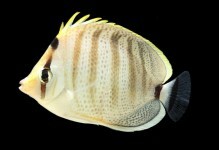 In the wild Indigo Hamlets establish themselves in a particular area of the reef where they will live their entire life assuming conditions permit. They should be provided with both areas of open swimming space and live rock formations that include plenty of caves and crevices. They will establish an area of the aquarium as their territory and will protect this area from similar sized fish species and other Hamlet specimens. Well fed Indigo Hamlets should not show too much aggression towards small fish species or cleaning crew invertebrates, but it is possible that they may try to eat very small fish and small crabs / shrimp. Their moderate size and meaty food diet puts a fair amount of bio-load on the aquarium, thus the aquarium should have excellent mechanical and biological filtration. An addition of a well planted refugium will also help with nitrate removal and lessen the amount of water changes required to maintain lower nitrate levels and overall water quality. In the wild Indigo Hamlets eat mostly small crabs, crustaceans and shrimps with the occasional small fish. They are a carnivorous species that should be fed a variety of meaty foods. Indigo Hamlets should be fed 2 to 3 times per day an amount of food that they will consume within a few minutes. Good food choices include: high quality commercial pellets, frozen carnivore formulas, mysis shrimp, clams, squid, frozen marine feeder fish (silver sides), live glass shrimp and other similar marine based meaty items.